An international team of more than 200 astronomers from 18 countries, including researchers from University College Dublin (UCD), has today published the first phase of a major new sky survey at unprecedented sensitivity using the Low Frequency Array (LOFAR) telescope. The survey reveals hundreds of thousands of previously undetected galaxies, shedding new light on many research areas including the physics of black holes and how clusters of galaxies evolve. A special issue of the scientific journal Astronomy & Astrophysics is dedicated to the first twenty-six research papers describing the survey and its first results. Radio astronomy reveals processes in the Universe that we cannot see with optical instruments. In this first part of the sky survey, LOFAR observed a quarter of the northern hemisphere at low radio frequencies. At this point, approximately ten percent of that data is now being made public. It maps three hundred thousand sources, almost all of which are galaxies in the distant Universe; their radio signals have travelled billions of light years before reaching Earth. Associate Professor John Quinn, UCD School of Physics and his PhD student, Sean Mooney, who is supported through an Irish Research Council Government of Ireland Postgraduate Scholarship, are members of the LOFAR surveys key science project. They are lead authors on one of the papers published today and contributed to several others. Their paper is focused on the jets from supermassive black holes that are pointed towards the Earth. Creating low-frequency radio sky maps requires significant computational resources. Much of the analysis has been done at a data centre at SURFsara in Amsterdam, which hosts over 20,000 terabytes of LOFAR data. “It is the largest astronomical data collection in the world. Processing the enormous data sets is a huge challenge for scientists. What normally would have taken centuries on a regular computer was processed in less than one year using the high throughput compute cluster (Grid) and expertise”, said Dr Raymond Oonk, SURFsara, a member of the international team of researchers. Machine learning algorithms are being used to automate parts of the analysis, with some of this work being done at UCD on powerful computing clusters. The international LOFAR telescope consists of a European network of radio antennas, connected by a high-speed fibre-optic network spanning seven countries. LOFAR was designed, built and is now operated by ASTRON (Netherlands Institute for Radio Astronomy), with its core located in Exloo in the Netherlands. The Irish station was installed in the grounds of Birr Castle, Co. Offaly in 2017, with support from Science Foundation Ireland, Enterprise Ireland, the Department of Business, Enterprise, and Innovation, Offaly County Council, the Department of Culture, Heritage, and Gaeltacht, UCD, TCD, Armagh Observatory, DCU, UCC, NUIG, DIAS, and AIT. The 26 research papers in the special issue of Astronomy & Astrophysics were done with only the first two percent of the sky survey. The team aims to make sensitive high-resolution images of the whole northern sky, which will reveal 15 million radio sources in total. “This sky map will be a wonderful scientific legacy for the future. It is a testimony to the designers of LOFAR that this telescope performs so well”, said Carole Jackson, Director General of ASTRON. “Just imagine some of the discoveries we may make along the way. I certainly look forward to it”, she added. The special issue of Astronomy & Astrophysics is titled LOFAR Surveys. The paper which Sean Mooney and Associate Professor John Quinn are lead authors is entitled Blazars in the LOFAR Two-Metre Sky Survey First Data Release. The latest all sky images observed by I-LOFAR show the radio sky above Birr during the day in amazing detail yet again. The images below were recorded and created by undergrad student David McKenna from Trinity College Dublin using code developed during his final year project. Each image is taken at different times from the observation where astrophysical objects are at their highest in the sky. Included here are Cassiopeia A, the Milky Way and, the North Galactic Spur. This video shows the entire observation from 20:00 GMT on February 5th to 08:00 GMT on February 6th at 30MHz. Dublin, Ireland, February 18, 2019: An international team of scientists from Trinity College Dublin, the University of Helsinki, and the Dublin Institute for Advanced Studies today announced a major discovery on the nature of solar storms in the journal Nature Astronomy (PDF available at Springer Nature SharedIt). The Sun is the closest star to our planet in the Universe, and like many stars, it is far from quiet. Sunspots, many times the size of Earth, can appear on its surface and store enormous reservoirs of energy. And it is within these regions that huge explosions called solar storms occur. Solar storms are spectacular eruptions of billions of tonnes of hot gas travelling at millions of kilometres an hour. If they impact the Earth, they can produce beautiful displays of the aurora, but they can also cause problems with communication and navigation systems and power grids. 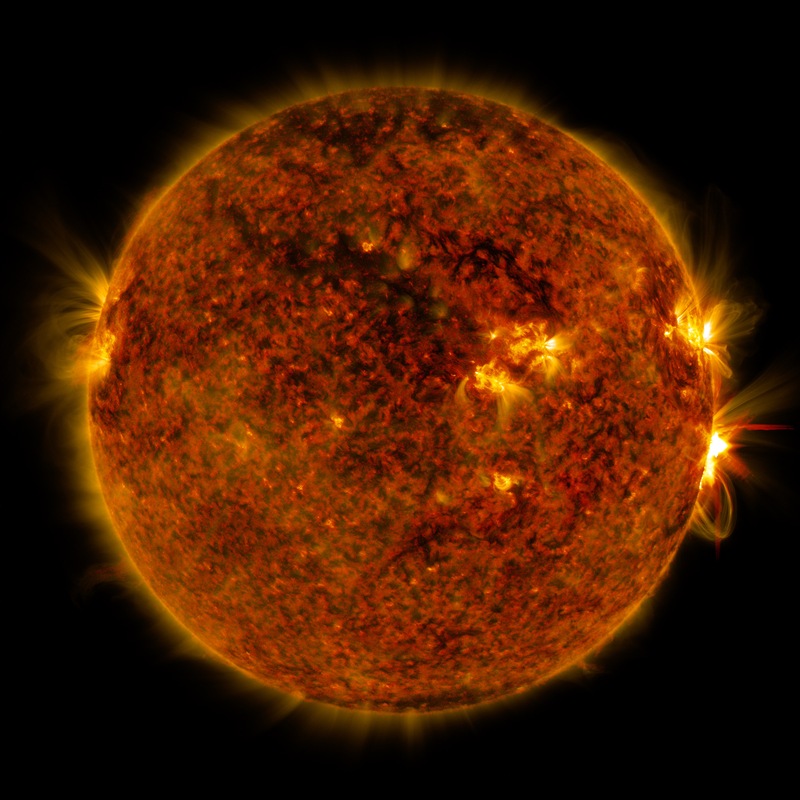 In 1859, the largest solar storm ever observed – the so-called Carrington Event – erupted. Within hours, it generated displays of the aurora as far south as Italy and Cuba and caused interruptions in early telegraph systems in Europe and the US. In Ireland, it reportedly stopped London stock market prices being received in Dublin “due to a strange atmospheric phenomenon”. Image of a solar flare observed by NASA’s Solar Dynamics Observatory on September 10, 2017. Credit: NASA/SDO. Print resolution available from NASA SVS. Our society is now even more dependent on technology, and solar storms have the potential to cause significant effect on their performance. In 2003, transformers in South Africa were damaged, while Swedish air traffic control systems were closed down in 2015 for more than an hour due to effects associated with a solar storm. More recently, emergency response communications were interrupted during hurricane season in September 2017 in the Caribbean. “We used data from the Low Frequency Array, LOFAR, together with images from NASA, NOAA and ESA spacecraft to work out where particles are accelerated by the particularly large solar storm on September 10, 2017, soon after we turned on the Irish LOFAR station”, said Dr Diana Morosan, the lead author on the publication, and affiliated with Trinity and the University of Helsinki. “Our observations enabled us to work out that the solar storm created a huge shock wave as it erupted from the Sun, which then accelerated electrons that generated radio bursts. This gives us an amazingly detailed insight into how solar storms work, and may in the future help us to produce more accurate forecasts of when solar radio bursts occur and how they impact the Earth”, said Dr Morosan. “These excellent results from I-LOFAR demonstrate the quality of the site in Ireland and the benefits of international collaboration in research and innovation. I am delighted to see such a return from the Government funding for I-LOFAR.” Minister of State for Training, Skills, Innovation, Research and Development, John Halligan T.D. I-LOFAR is funded by Science Foundation Ireland and the Department of Department of Business, Enterprise and Innovation. A PDF of the Nature Astronomy publication can be accessed free-of-charge at Springer Nature SharedIt. I-LOFAR is owned and operated at Birr Castle by Trinity College Dublin on behalf of the I-LOFAR Consortium, which includes Trinity College Dublin, Dublin Institute for Advanced Studies, Armagh Observatory & Planetarium, University College Dublin, University College Cork, National University of Ireland, Galway, and Athlone Institute of Technology. The I-LOFAR fibre link is sponsored by open eir.